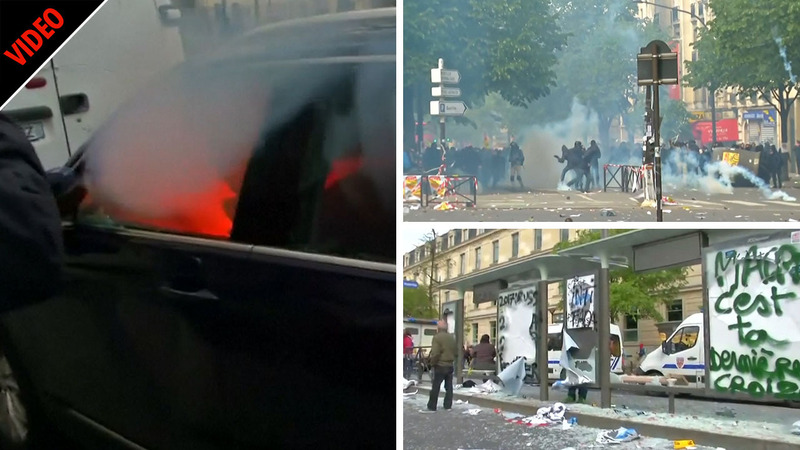 MASKED anarchists have smashed windows and looted a McDonald's as thousands brought carnage to Paris in May Day protests. The far-Left agitators chucked petrol bombs through windows and torched cars while others clashed with police. Some threw rocks at cops in the French capital, who responded with tear gas, as the protest marches to mark International Workers' Day turned violent. Dramatic pictures show demonstrators wearing masks as they shatter windows at McDonald's before setting it on fire. "Anti-Capitalist" looters then helped themselves to food and drinks before grabbing cash from broken tills on the charred floor. Blazing cars can also be seen after thousands flooded the streets to march for the rights of workers around the world. Hooded protesters also stripped of fireworks during the chaos in Paris today as plumes of thick black smoke billowed across the city. Elsewhere, Londoners marched through Trafalgar Square holding up pictures of Soviet dictator Joseph Stalin. The demonstration was against industrial disputes over pay, hours, union recognition and outsourcing. Workers included staff in a long-running pay dispute at cinema chain Picturehouse, cleaners at the Ministry of Justice campaigning for the London living wage, and cleaners from King's College pressing for work to be brought in-house. In Istanbul, more than a dozen people were detained after attempting to march towards the city's symbolic main square in defiance of a ban on protests there. Police could be seen using brutal force to arrest the protesters as they defiantly chanted against government reforms. Around 25 people shouted "Taksim cannot be off limits on May 1" as they made their way to off-limits Taksim Square. In 1977, 34 people were killed there during a May Day event when shots were fired into the crowd from a nearby building. In the Philippines, around 5,000 people gathered together near the presidential palace in Manila to rally over the failure of Philippine President Rodrigo Duterte to fulfil a major campaign promise to end short-term employment. Clutching banners branding the president the "Liar King", they also demanded that the government address issues including low wages, unemployment and trade union repression. Meanwhile in South Korea, thousands protested in Seoul for a higher minimum wage and other demands. Around 10,000 workers in Indonesia rallied near the presidential palace in Jakarta - urging the Government not to outsource and to raise their wages.